ART for the Masses, ART for the People. : Amy Winehouse Singer/Songwriter. AMY 4, 2015?, IP HS.FJ 11. by Glasgow Cowboy: Current and Past Work Jan 2008 onwards. Portfolio: Current and Past Work Jan 2008 onwards. Amy Winehouse Singer/Songwriter. AMY 4, 2015?, IP HS.FJ 11. 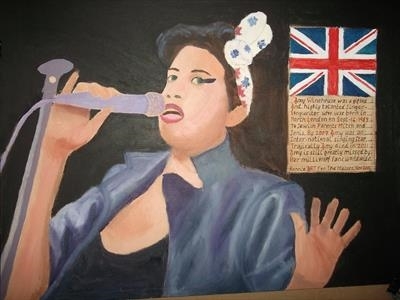 This is an oil painting of Amy from a photo in a book, This is only the fourth oil painting I have ever done, I learned a lot from completing it and this is what I want to do for some of the great and good talented people from my past and present, mostly singers and football players. I am really unhappy with this likeness of AMY and I forgot to paint in her bust. The painting is in the back of my bedroom cupboard. One day I will get it out and work on it again, Sat 9-Sept-2017. ART For The Masses ART For The People.